Get a Maintenance Plan to fund OpenFOAM Sustainability and meet funders, core team and contributors at the OpenFOAM Hub. 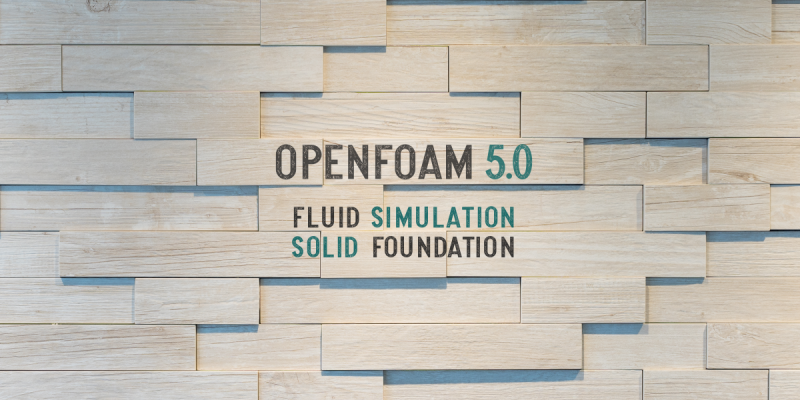 OpenFOAM is the leading free, open source software for computational fluid dynamics (CFD), owned by the OpenFOAM Foundation and distributed exclusively under the General Public Licence (GPL). The GPL gives users the freedom to modify and redistribute the software and a guarantee of continued free use, within the terms of the licence. OpenFOAM was created by Henry Weller in 1989 under the name “FOAM” and was released open source as “OpenFOAM” by Henry Weller, Chris Greenshields and Mattijs Janssens in December 2004. Since then, OpenFOAM has continued to be managed and developed with new versions being released to the public each year. The current version is 6. In 2014, the development line of OpenFOAM, known as “OpenFOAM-dev” was released publicly on GitHub. The OpenFOAM Foundation is the organisaton which holds the copyright of the OpenFOAM software and documentation, whose purpose is to manage and distribute OpenFOAM as free, open source software for the benefit of its users. It is a registered company, limited by guarantee based in England. As such, it has no share capital or shareholders, but has individual members committed to free, open source software, who run the organisation on a voluntary basis. It has no employees and any annual profit is retained within the organisation and cannot be distributed to members. OpenFOAM® is a registered trademark of OpenCFD Ltd, licensed to the OpenFOAM Foundation in 2011 so that it could distribute its software under under that name. The packages for Ubuntu can be installed directly on MS Windows 10, and on older Windows systems using a virtual machine. OpenFOAM is developed and maintained by individuals who contribute their work to the project, with the support and consent of the companies that employ them. The project operates through a network of trust between the individuals, where greater authority is given to contributors who consistently produce high quality work and demonstrate long term commitment. Contributions are made under the OpenFOAM Contributor Agreement (to facilitate enforcement of the free, open source licence), signed either by the individual, or by the organisation that employs them. The principal contributors to OpenFOAM are: Henry Weller (OpenFOAM’s creator), Chris Greenshields (OpenFOAM co-founder) and Will Bainbridge from CFD Direct Ltd; Bruno Santos, from blueCAPE. There is a growing list of contributors, who test and improve various aspects of OpenFOAM. OpenFOAM is kept reliable and robust by timely resolution of issues reported by users to the OpenFOAM Issue Tracking System. Everyone who reports an issue, where the behaviour of OpenFOAM does not meet reasonable expectations, is making a useful contribution. At the heart of OpenFOAM is a unique, and highly extensible, software development kit (“devkit”) for CFD, consisting of 1 million lines of C++ code. OpenFOAM includes hundreds of robust CFD applications built from the devkit, which can be extended and customised, quickly and conveniently. The applications are used to create CFD simulations by industry, academic, and research and government institutes, across all fields of engineering and science. OpenFOAM — and especially the devkit — must be maintained to a high standard for organisations to enjoy the benefits of using OpenFOAM. CFD Direct employs software engineers, led by Henry Weller, that maintain OpenFOAM. Companies fund new functionality in OpenFOAM through contracted development and support with CFD Direct. Maintenance plans are available to businesses to support the cost of ongoing maintenance of OpenFOAM, giving priority to issues that affect them most. The OpenFOAM Foundation is run by individuals whose priority is to make CFD accessible and inclusive. It ensures that OpenFOAM will always be free and open source (only) and maintains OpenFOAM beyond the control of any large organisation who might put commercial interest ahead of the interests of the users. It ensures that OpenFOAM is developed and maintained to meet broad needs of all users, rather than to limited needs of one or two large corporations. The OpenFOAM Foundation takes responsibility for enforcing the licence of OpenFOAM, to protect the rights of contributors who make a conscious decision to release their work free and open source. Users should welcome and encourage licence enforcement, because without it, the contributors — who are the lifeblood of OpenFOAM — would inevitably withdraw their support. Access documentation, and enrol for training, from the OpenFOAM experts. General information about running OpenFOAM, compilation, solvers, models, mesh generation and post-processing. CFD Training based on features to simplify use, and accelerate learning, from the main developers at CFD Direct. The C++ Source Guide, generated by Doxygen has links to source code, inheritance and collaboration diagrams, and more. Discover the people behind OpenFOAM and how they contribute to the project.